Cox Richardson Architects are contributing to vertical urban living in Chatswood with three residential towers above Chatswood Station. This transport-oriented development takes advantage of the of the trains, shopping, bars and restaurants all available in the one location below the towers. 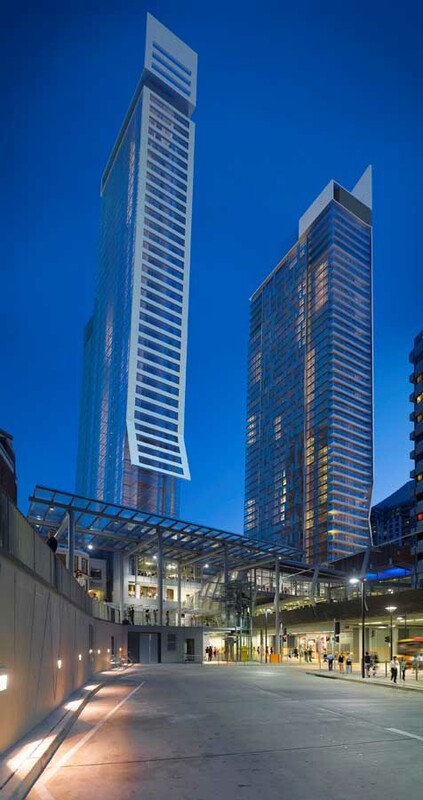 The initial design concept for the development, jointly conceived by Cox Richardson and DesignInc, crowns Chatswood’s Transport Interchange with distinct diadem created by the folding blades atop each tower. Tyrrell said, “Architecturally, the exciting thing about this design is the ambiguity embedded in the scheme. There is an ambiguity of use for instance and restrained elegance achieved by the enclosure of the external balconies that improve amenity by controlling wind speeds on the balcony. Also the feature blade wall on each tower kicks out as a skirt to address down draughts onto the street below. Aesthetically, both these features and make it hard to tell if the building is residential or commercial in function and genre. Clearly others agree. The first two towers (Metro View and Metro Spire) sold out in one weekend, and the final third tower (Metro Grand) is selling fast. At up to 260 metres above sea-level these sculpted structures will provide views to Sydney Heads, across the CBD, west to the Blue Mountains and north over the Ku-ring-gai National Park. The retail centre at the base of the new complex will boast a thriving ‘Eat Street’ on the western side of the podium and a sun lit and naturally ventilated north/south pedestrian street connecting the heritage listed Garden of Remembrance with Chatswood Mall. “The key to excellence in apartment design is, we believe, in creating a sense of space and light; an experience that extends from the entry through the living areas to the terrace. The building façade design maximises the incredible views, with many full height glazed panels allowing natural light to penetrate and enliven the living spaces. Construction of the Transport Interchange and Retail Centre commenced in 2005 and the station was formally opened in 2008. The Retail Centre fitout is due to commence soon and the three residential towers above are proceeding at pace. The towers will integrate urban living into the heart of Chatswood’s shopping, dining, working and entertainment precinct. Residents will be able to use an indoor 25-metre heated lap pool, spa, fully-equipped gymnasium, and a landscaped outdoor sun terrace. Metro View and Metro Spire on the north-eastern edge of the already completed retail podium, provide 292 apartments with the third tower, Metro Grand, on the western side of the site offers 261 apartments. These range from compact one bedroom apartments to spacious luxury sub-penthouses and penthouses atop the three towers. Established in 1964, COX is one of Australia’s most awarded architecture practices well known for its many iconic projects. It is an integrated company providing services in planning, urban design, architecture and interior design to clients both nationally and internationally. The 2010 Sir Zelman Cowen Award for Public Architecture was a clear demonstration of this – being awarded this year to the Epping to Chatswood Rail Link, Intermediate Stations in Sydney by national practice HASSELL.